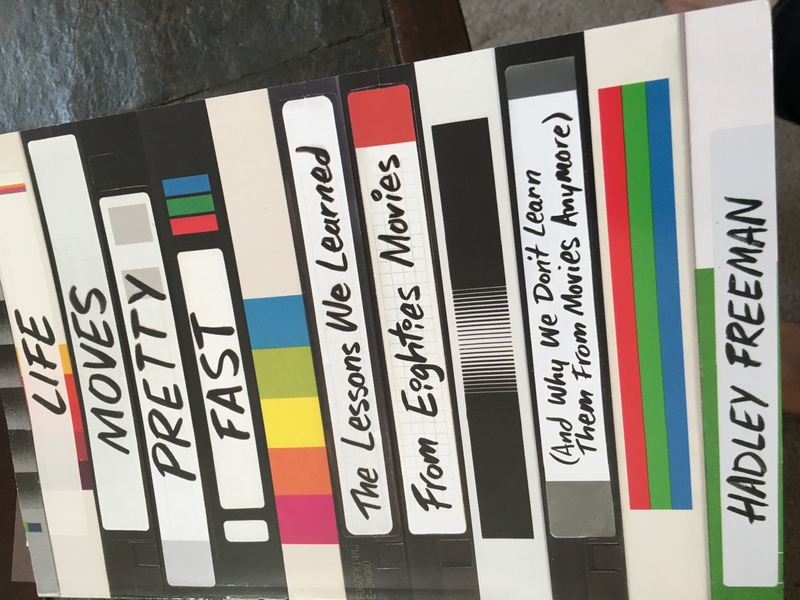 While browsing through a quaint bookshop last week, drawing my hand across stacked paperbacks on a table, I touched down on Hadley Freeman’s Life Moves Pretty Fast: The Lessons We Learned From Eighties Movies (And Why We Don’t Learn Them Anymore). I picked it up for a perfunctory flip-through and knew instantly it would be coming home with me. If you, like me, were a movie-loving teen in the eighties you were lucky! Many now classic films were released, many of them with teenagers as the lead characters. This is when my love affair with the cinema blossomed and I came to know the power of film to connect us, enlighten us and make us feel less alone in the World. In Life Moves Pretty Fast, journalist Hadley Freeman uses interviews and commentary by writers, directors and actors along with her own personal insights to explore the lessons of these films. She discusses them with reverie, she is a BIG fan, but she also puts them in a social and cultural context that absolutely lit me up. Several times I had to slap the book down and say to myself: I never thought about it like that! Freeman discusses other important messages in Dirty Dancing, some of which have nothing to do with the romance between Baby and Johnny. But let me just, for a moment, express my gratitude for all those shots of Patrick Swayze! Another “ism” explored in detail is classism. She points out that social class and the disparity it creates is a central focus in most of John Hughes’s teen films. If you just think about Pretty in Pink, The Breakfast Club, or Sixteen Candles you will see it right away. It is obvious, but I never thought about it in depth. Freeman does. Some Lessons Learned are simply (but profoundly) about love and friendship. The chapters on The Princess Bride and When Harry Met Sally are absolute Valentines to two movies at the top of my favorites list. Her words offered me new perspectives on films I thought I knew cold, only adding to my adoration. As it happened my dear Jesse was on a business trip as I was reading this book. So for five nights I hosted my own private Eighties Film Festival in our living room featuring Dirty Dancing, Ghostbusters, Ferris Bueller’s Day Off, Baby Boom and When Harry Met Sally. Tears were shed, laughter erupted and my hand landed on my chest countless times in nostalgia and love. The whole experience of reading Life Moves Pretty Fast and re-watching these films triggered my sentimentality as much as my intellect. The affection I feel for these movies is not separate from the longing I sometimes feel for simpler times. Sentimentality does not always remember the complexity of youth or prior eras. Freeman strikes the balance well, loving these films purely while acknowledging their shortcomings too. Though I don’t agree with all of Freeman’s points of view (she disparages Footloose and Love Actually, movies I adore, and I can’t muster anywhere near her passion for Ghostbusters), I found her book hilarious, infuriating, insightful and as sweet as it was smart. If you love movies, the 80s and sharp, well-researched writing that will tickle your funny bone – I highly recommend it!